When it comes to pregnancy, pregnancy cravings are no stranger. For some soon-to-be moms, pizza is one of the many comfort foods they may find themselves demanding around the clock. Pizza is generally safe to eat during pregnancy, so long as it is thoroughly cooked and served hot. In addition, pizzas that is topped with soft or blue-veined cheeses such as brie, camembert or blue cheese should be approached with caution as these types of cheese contain more bacteria than other cheeses. 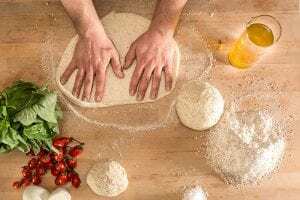 If you find yourself craving pizza during your nine-month journey and wishing that this guilty pleasure didn’t make you feel so guilty, rest assured there are some healthy approaches you can take. And with their higher protein, vitamin, mineral, fiber and phytonutrient counts, these pizza recipes run circles around the traditional varieties. In a food processor, pulse the cauliflower until very finely chopped. Measure 1/2 cup and put into a medium bowl. Add the chickpea flour and salt. Stir in 3/4 cup of water, and let stand for 20 minutes. Heat the oven to 450 degrees. In a 9- or 10-inch ovenproof skillet, heat 1 tablespoon of the oil over medium-high heat. Pour in the batter and let cook until the underside is golden brown, 3 to 4 minutes. Flip the crust and remove from the heat. Top with the zucchini, red bell pepper and yellow bell pepper, drizzle with the remaining 1 tablespoon oil, and sprinkle with the Parmesan. Bake until the vegetables are tender, 12 to 15 minutes. Sprinkle with the oregano and red pepper flakes, slice, and serve. In a small bowl, stir together water, yeast and sugar. Let stand for 5 minutes, or until mixture looks foamy. In a large bowl, stir together all-purpose flour, whole-wheat flour, cornmeal and salt. Add yeast mixture and olive oil to flour mixture and mix until the dough comes together, adding additional warm water, 1 tablespoon at a time, if dough is too dry. The dough shouldn’t be too moist, however. Transfer dough to a floured work surface, and knead until smooth and elastic, about 5 minutes. Place dough in a large greased bowl and turn to coat. Cover bowl with a clean kitchen towel and set aside in a warm, draft-free location for 1 hour or until dough is about double in size. Punch down dough and knead again for 2 minutes on a lightly floured surface. Divide dough into two pieces. One of these pieces will make one pizza. Wrap what you’re not using immediately in plastic wrap and refrigerate for up to 2 days or freeze up to 2 months. Bring dough back to room temperature before rolling. To prepare dough, preheat oven to 450 degrees. Coat a rimless baking sheet with 1 teaspoon oil or top with a sheet of parchment paper. Roll dough into 12-by-9-inch rectangle or 12-inch round no more than 1/4 inch thick. Transfer to prepared sheet, prick crust all over with fork and brush dough with another 2 teaspoons of oil, concentrating on the edges. To make sauce, place sun-dried tomatoes in a bowl and cover with hot water until softened, about 15 minutes. Place soaked tomatoes, 3 tablespoons of the soaking liquid, roasted red bell peppers, olive oil, oregano, chili flakes and black pepper in a blender and mix until smooth. Set aside. Fry steak slices with 2 teaspoons olive oil, 6 minutes on each side. Spread tomato sauce over pizza dough and top with steak and remaining ingredients, in order. Bake for 15 minutes. Garnish with basil. Place your pita on a cookie sheet and cover with pizza sauce. Next layer on the yellow pepper, diced ham, and diced pineapple. Cover with desired amount of mozzarella cheese. Cook in the oven for about 8-10 minutes. Preheat oven to 450 degrees. Coat a 12-inch cast-iron skillet with cooking spray or olive oil. Combine broccoli stems, basil, walnuts, garlic, lemon juice and salt in a food processor. Pulse until finely chopped. Add oil and process to combine. Cook sausage in a small skillet over medium-low heat, breaking up with a spoon, until no longer pink, 4 to 6 minutes. Working on a lightly floured surface, roll and stretch pizza dough into a 12-inch circle. Transfer to the prepared pan, pressing the dough 1 inch up the sides. Spread the dough with the pesto and sprinkle with the sausage, broccoli florets, lemon zest, mozzarella, tomatoes, Parmesan and pepper. Bake the pizza until the crust is golden brown and the cheese is browned in spots, 30 to 35 minutes. Let stand for 10 minutes before serving. Combine ingredients in a large bowl and bring together with your hands. On a floured surface, knead the dough for around 5 minutes until it feels stretchy. Add a little more flour if it seems too wet. Use a floured rolling pin to roll the dough out. Top with your favorite toppings and bake in the oven at 350 degrees until golden brown. Eating healthy when you’re pregnant is every mom’s goal, but those pesky cravings can sometimes make it a challenge. Enjoy these nutritious make-at-home meals for a healthy option to put your pizza cravings to bed.